Like in any field when you start you need to know the basics. In Day Trading you need to do the same. Here are some tips to get started and head to the right direction to avoid any obvious pitfalls. These professional level tips will help you equip with knowledge of software and help you decide what and when to trade. We have gathered so free charts which are vital to successfull trading. A day trader will need to decide in three main things when trading. Volatility, liquidity and which item to trade in. Volitility is simply the highs and lows of the day. Liquidity is the price at which traders enter and exit positions. Higher the volitility at that day can result in higher profits or higher losses. After trader has decided which item or stock they want to trade in they can define entry points. There are couple of tools available to help you with entry points. A day trader needs to decide on price target at which point to sell its purchase. Fading. Fading is used when day traders “short stocks” after the price goes up. 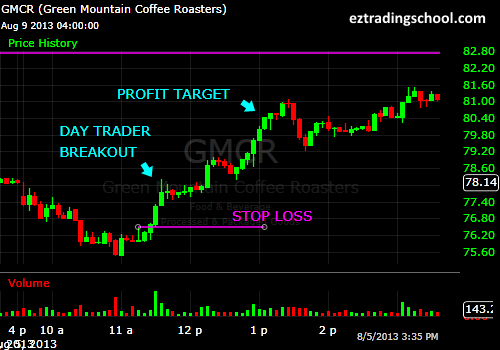 The target price would be when other buyers start buying again particular asset you are day trading with. Scalping. Scalping is very popular and well known day trading strategy used today. This is simply to sell the stock or currency quickly as soon as is becomes profitable. Daily Pivots. Day pivots is a popular strategy with day traders and it is specially good for beginner traders. A day trader would benefit from volitility. The aim is to buy stocks at lowest price during the day and then sell at its highes price on same day. The target price could be used in conjunction with scalping or wait longer for better profits. Many people want to start in day trading in order to quit their 9 to 5 jobs. It’s very true that alot of newbie day traders give up very early or lose interest because they don’t make a profit. However and smaller percentage of day traders keep going and try harder by learning more or trying new strategies actually end up making more than their regular job and become full time traders. The key lesson here is the even the most experienced and professional trader lose due to different reasons but that doesn’t make them quit because they know what kind of business they are in and after losing they learn something about their strategy and the market. The important thing is to keep evaluating your performance by keeping track of winning and losing trades and somewhat know the reasons behind it. If you can tell why you won a particular trade then you would start to be able to predict when the prices will increase or decrease helping you to make buying or selling decision. Like anything day trading takes long time to master. Do your homework and start with demo broker accounts to practice. Good luck and email us if you need any help. Previous Previous post: 1K Daily Profit App Review – Does it work or its a Hoax?